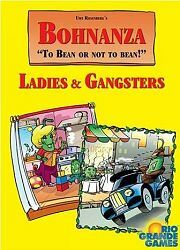 Bohnanza - Ladies and Gangsters is a stand alone card game by Uwe Rosenberg that offers two different modes of play. First, Ladies has female versions of the beans from Bohnanza with better payouts than the male counterparts. Second, we have Gangsters that pits 1-2 players against the Bean Mafia, and the players must have more profit than the mafia to win. Gangsters also offers a few new beans.